The South Big Horn Conservation District Board recently selected Jenny Mercer as the 2006 Cooperator of the Year. Jennifer and her husband", Justin, and Justin's father, John, own a cow-calf operation near Hyattville. Jennifer and Justin are the proud parents of a new baby girl, Grace Cathryn, born on March 3, 2006. 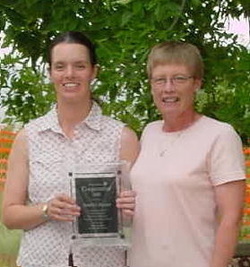 Jennifer received her award at the annual Conservation District fish fry at the Hamilton Ranch on July 18, 2006. Jennifer has been involved with the South Big Horn Water Quality Steering Committee since its formation in January of 2001. What is exceptional about Jennifer’s involvement with the Committee is that she has undertaken the responsibility to write, defend and even help administer the Clean Water Act Section 319 Grant for watershed planning and conservation implementation projects. Jennifer has also been the lead contact for both the feedlot and the septic applications for cost-share assistance provided by two DEQ 319 grants which she wrote and presented for the Conservation District. She reviews the ranking sheets from both projects and brings sheets to the Water Quality meetings for approval. In addition, Jennifer wrote the South Big Horn Watershed Plan with the assistance of the local Water Quality Steering Committee. Jennifer researched the Natural Resource Inventory that the District had completed and started by pulling that information together for the beginning section of the watershed plan. She attended monthly meetings of the Water Quality Committee and discussed each section with the group. In between meetings, she took it upon herself to write narrative conveying the thoughts and ideas of the committee for additional sections in the watershed plan. Jennifer would then bring the newly written narrative to the next meeting and ask the committee to review, make corrections and additions. Jennifer compiled the entire document for the District. The plan has been completed and sent to the DEQ for comments. Jennifer has continued on helping with the process as the Water Quality Committee wrote responses to all of the comments received during the comment period. The Watershed Plan is almost ready to be filed with the DEQ and the local County Clerk. The agricultural community as a whole benefits from Jennifer’s commitment to natural resource management. Her efforts to improve water quality have been recognized by the Governor’s Non-point Source Task Force Committee. Above photo: Linda Hamilton, Chairman of the South Big Horn Conservation District, presenting award to Jennifer Mercer. Photo by Carol Brown, Staff.